1. What is the character of the bond in carbon monoxide? 2. Which of the following molecules contains the oxygen atom with the most negative formal charge? 3. Which of the following structure(s) contribute most to NO2’s resonance hybrid? 4. Which of the following correctly ranks the compounds below by ascending boiling point? 5. Both CO32– and ClF3 have three atoms bonded to a central atom. What is the best explanation for why CO32– has trigonal planar electronic geometry, while ClF3 has trigonal bipyramidal electronic geometry? 1. CO32– has multiple resonance structures, while ClF3 does not. 2. CO32– has a charge of −2, while ClF3 has no charge. 3. ClF3 has lone pairs on its central atom, while CO32– has none. 4. CO32– has lone pairs on its central atom, while ClF3 has none. 6. Which of the following has the largest dipole moment? 7. Despite the fact that both C2H2 and HCN contain triple bonds, the lengths of these triple bonds are not equal. Which of the following is the best explanation for this finding? 1. In C2H2, the bond is shorter because it is between atoms of the same element. 2. The two molecules have different resonance structures. 3. Carbon is more electronegative than hydrogen. 4. Nitrogen is more electronegative than carbon. 8. Which of the following is the best explanation of the phenomenon of hydrogen bonding? 1. Hydrogen has a strong affinity for holding onto valence electrons. 2. Hydrogen can only hold two valence electrons. 3. Electronegative atoms disproportionately carry shared electron pairs when bonded to hydrogen. 4. Hydrogen bonds have ionic character. 9. Which of the following best describes the number and character of the bonds in an ammonium cation? 10.Although the octet rule dictates much of molecular structure, some atoms can violate the octet rule by being surrounded by more than eight electrons. Which of the following is the best explanation for why some atoms can exceed the octet? 1. Atoms that exceed the octet already have eight electrons in their outermost electron shell. 2. Atoms that exceed the octet only do so when bonding with transition metals. 3. Atoms that exceed the octet can do so because they have d-orbitals in which extra electrons can reside. 4. Some atoms can exceed the octet because they are highly electronegative. 11.Which of the following types of intermolecular forces provides the most accurate explanation for why noble gases can liquefy? 12.In the structure shown, which atom(s) have the most positive charge? 1. 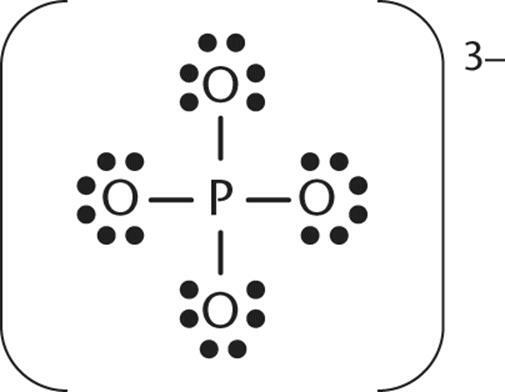 The phosphorus atom has the most positive charge. 2. All atoms share the charge equally. 3. The four oxygens share the highest charge. 4. The oxygen at the peak of the trigonal pyramidal geometry has the most positive charge. 13.Which of the following is the best name for the new bond formed in the reaction shown? 14.Both BF3 and NH3 have three atoms bonded to the central atom. Which of the following is the best explanation for why the geometry of these two molecules is different? 1. BF3 has three bonded atoms and no lone pairs, which makes its geometry trigonal pyramidal. 2. NH3 is nonpolar, while BF3 is polar. 3. NH3 has three bonded atoms and one lone pair, which makes its geometry trigonal pyramidal. 4. BF3 is nonpolar, while NH3 is polar. 15.Which of the following best describes an important property of bond energy? 1. Bond energy increases with increasing bond length. 2. The more shared electron pairs comprising a bond, the higher the energy of that bond. 3. Single bonds are more difficult to break than double bonds. 4. Bond energy and bond length are unrelated.